We need to sort the equipment for Manchester Beer and Cider festival which is stored in shipping containers at Broughton Cricket & Rugby Club,Yew street,Salford M7 2HL. Can you spare a few hours from 10am on Sunday 12/11/17, the containers will need stripping out and repacking ready for shipment to Manchester Central in January for festival set up. The Club Kitchen should be open to purchase breakfast/Tea/Coffee but bring your own if you want too. Salford Branch are organising a crawl around some of Manchester and Salford’s “Haunted” Hostelries and what better evening to do it than Halloween! Please note that the New Oxford will be opening at 11am not 11.30am as originally printed on the poster!! event has now been confirmed for Saturday 8th July and will begin at the New Oxford. Arrive 11am for Registration and 11.30am Departure. 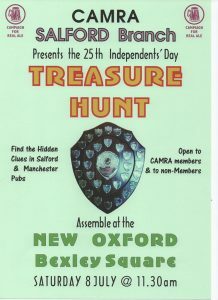 1) Meet in the Host Pub (This year it is the New Oxford, Bexley Square, Salford, from 11a.m. onwards on Saturday 8th July where you register your team (£1 per person) then solve a not-too-difficult puzzle and collect your entry sheet, this gives you the names of eight pubs in inner Salford and Manchester – all within walking distance, though there are some free buses. 2)Most of the day is spent browsing the pubs, looking for the answers to 24 cryptic clues (3 per pub) and sampling the occasional Real Ale. Please also take time to Eat at one of the many fine food establishments along the route or bring your own packed lunch. 3) Return to the Host Pub NO LATER THAN 6PM where question papers are handed in, checked and scored. The winners will receive a cash prize or sometimes beer tokens. It is the duty (and privilege) of the winning team to engrave their name on the next available badge, to be the custodians of the trophy for one year – usually displaying it in a pub of their choice – and to return it at the start of the following year’s competition. They also have the dubious honour of setting next year’s competition! Although Independents’ Day is under the aegis of CAMRA, you do not have to be a CAMRA member to take part, though of course we would be delighted if you decide to join us. The Crescent Pub in Salford has been listed as an Asset of Community value by City of Salford council. More details to follow.